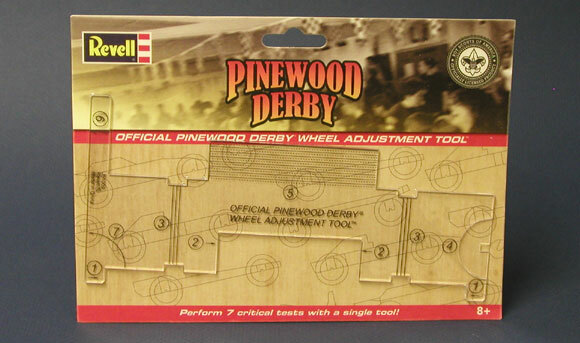 As many of you have heard through the pinewood derby forums, BSA has teamed up with Revell to offer their pinewood derby products in hobby and craft stores. 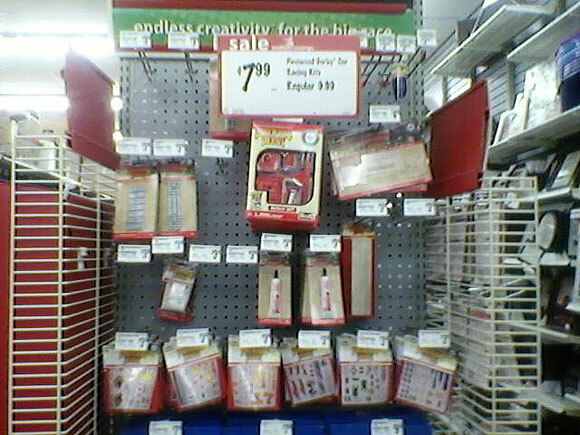 In our area, Michael’s Crafts and Hobby Bench are offering the Revell line (Michael’s is only offering Revell), while Hobby Lobby and others continue to only offer PineCar. Recently, my wife and I took a stroll into Michael’s to check out the Revell offering. The Revell rack contained slots for all colors of the BSA pinewood derby wheels, several tools, blocks and pre-cut kits. At the time of our visit, all but one set of wheels (a blue set) were gone (a typical hobby shop problem during pinewood derby season), and much of the rest of the inventory was well picked over. But we were able to buy several items to share with you. One thing that stood out to me was how every item, including decals, has the Revell logo. Clearly, this marketing partnership has been in the works for quite some time. 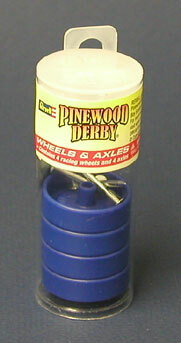 The wheels in the Revell packaging are the new BSA pinewood derby wheels. The axles are the standard BSA nail axle. The same tube packaging is used, but with the Revell label and a BSA hologram. In an axle polishing kit (600 grit sandpaper and pumice) are included four axles without burrs or crimp marks. Although the axles are similar in dimensions to the official nail, the axle heads do not exactly replicate the head of BSA nails. But wait a minute – since there are no burrs or crimp marks why would I use 600 grit paper and pumice? I’d just go straight to a metal polish. A little more thought is needed here. The Revell rack has slots for a wheel mandrel, a balance scale, a saw and an alignment tool. Most of these were out of stock, but we did find a knock off of the PineCar Alignment tool, complete with the seven checks. The one improvement in this tool is that the gap gauge is not on an easily breakable arm like it is on the PineCar version. What graphite is BSA/Revell pushing? 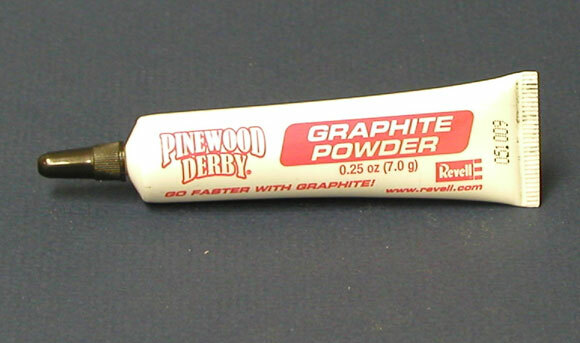 It is a Revell-branded graphite with a consistency very similar to Tube-O-Lube. It looks like they are not offering the white powder; one can only hope that they have stopped selling that terrible product. We purchased a slotted block and pre-cut kit. 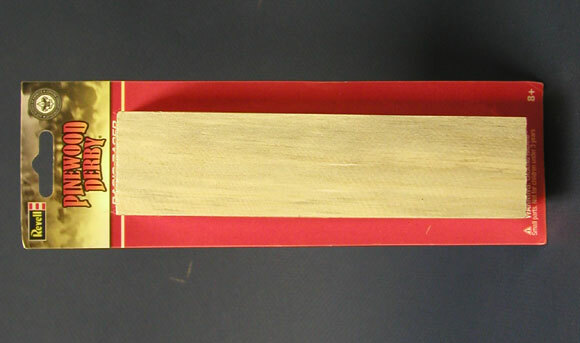 The slotted block is a poor replacement for the official block, and may not meet regulations at every pack. The slots are offset forward about 1/16 inch, are too narrow, and poorly cut — not to mention, the block is imported from China (as is most if not all of the Revell offering). The kit has official wheels and axles, a zinc plate weight, decals, etc. The “motor” parts are plastic, which in my opinion is better than the zinc parts offered by PineCar, as the plastic parts won’t interfere with setting a proper balance point. But again, the wood leaves quite a bit to be desired. The slots are reversed from proper positioning, are too narrow, and slightly crooked. On many of the pre-cut kits (not the one in the photo), the axle strut is cut so narrow, that it would likely break when an axle was inserted. Regardless of the problems mentioned (and the likely problems at car inspections from Revell branded products), overall it is good to give PineCar some competition, and to have BSA wheels and axles available at retail stores. We drill pilot holes with the Pro-Body Tool in our slotted blocks. Since I don’t trust my ability to draw a line at the middle of the slot to align the body tool, I instead use toothpicks to align the tool properly with the slots. I then clamp the tool in place, remove the tooth picks, and drill the holes. At least, this is what I was told by a professional cabinetmaker. In that profession the quantity of clamps is certainly important. But for pinewood derby use, having one or two clamps of the right type will make your work much easier and more accurate. There is a huge variety of specialty clamps available today, but we will focus on two types of clamps. 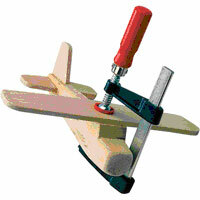 The first is a Quick-Grip clamp from Irwin, which is basically a bar clamp that is tightened by squeezing the handle. A lever then quickly releases the clamp. Quick-Grip clamps range in size from very small to quite large. 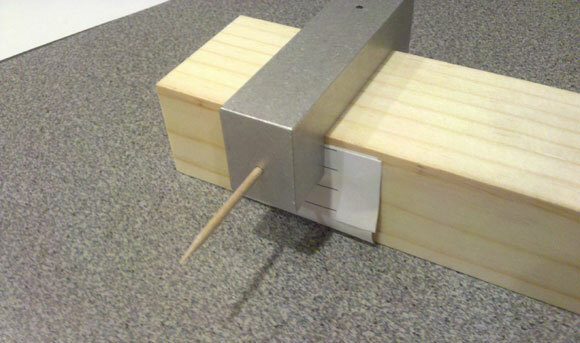 For pinewood derby use, the smallest is the clamp of choice. 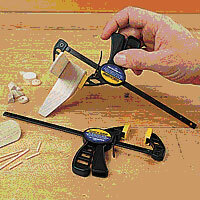 The second type of clamp is a Bar Clamp from Bessey. This clamp (sometimes referred to as an “F-Clamp” is similar to a traditional “C- clamp” in that it tightens with a bolt. However, this Bar Clamp is superior to a C-clamp in that it combines the bolt tightening method of the C-clamp with the adjustment mechanism of a bar clamp. This provides a wider range of clamping applications and faster clamping action. My recommendation is to acquire one of the Bessey Bar Clamps, and a pair of Quick-Grip Micro Clamps (normally sold in pairs). The combination of these two clamps will give you many options for clamping. Here are a few examples. Quick-Grip Clamp – The Squeeze Clamp is used where the size and force of a large clamp is not required. 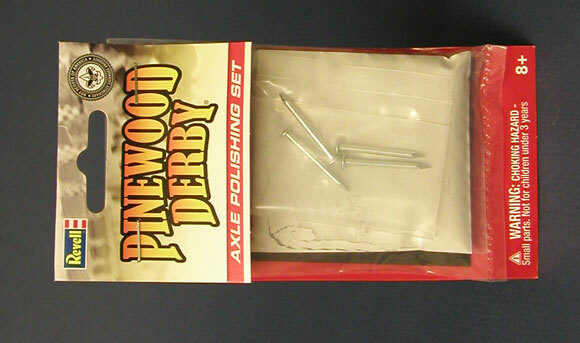 Possibilities include holding a wood or metal part to the pinewood derby car body while the adhesive dries, and holding a wood chip in place when repairing a flaw. Bar Clamp – The Bessey Bar Clamp is used where a larger force is required. Generally this is needed when the block must be sawed, drilled, or shaped with a file (an optional method for filing is described below). Combination Clamping – Sometimes it is helpful to use both clamps in combination. One opportunity is when a file (or Dremel-type tool) is used to shape the car body. If the car is clamped to a work bench, then the sides and bottom edge of the car cannot be easily worked. 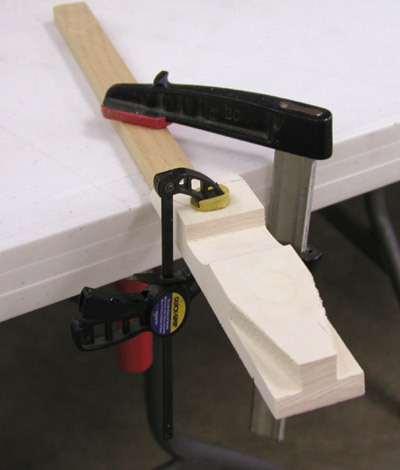 An alternative is to clamp the car to a narrow board using a Quick- Grip Clamp, and then clamp the board to the work bench with a Bar Clamp (see Figure 3). This method of clamping allows much more freedom of access than if the car was directly clamped to the work bench. 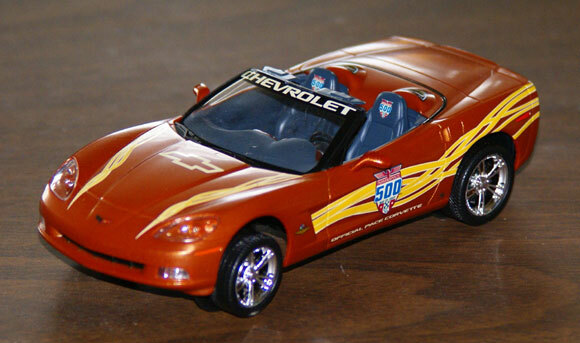 For this 2007 Corvette Pace Car I began with a plastic model and installed a pinewood frame with ball bearing wheels. Then I used the original Corvette wheels as hubcaps that do not spin. 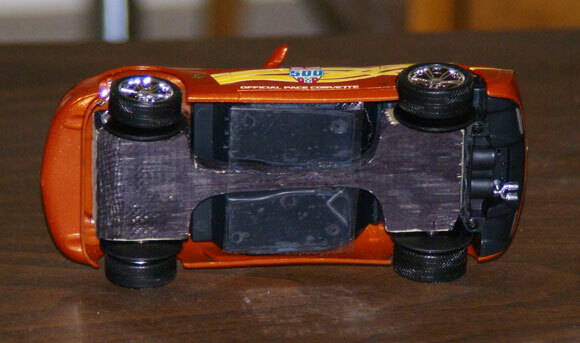 I can twist the front wheels which in turn will turn the slightly bent axles to steer the car straight. It is pretty fast, but I lost one exhaust pipe at the last race. Here is a picture of my real pace car. 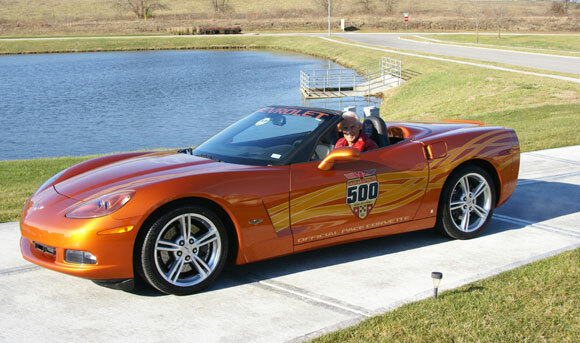 It is the 3rd lowest VIN# and was delivered to the Indianapolis 500 in 2007. 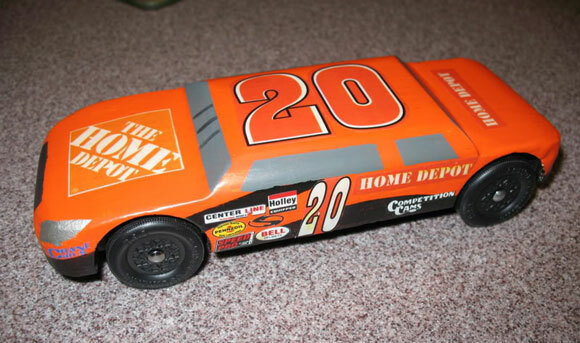 To build this Nascar, we added wood onto the sides. This increased the overall front profile of the car over what it would have been if we’d used the solid block of wood, so it wasn’t aerodynamic at all. The four cars that beat us in the district race were all sleek low profile jobs, but we didn’t lose by much. Perhaps in this case aerodynamics would have made a difference. Because we were copying a Nascar we had to leave the wheelbase more forward in the car than I would have liked. It was still rear- weighted, but the center of gravity was about 0.75 inches further forward than if we had pushed the wheelbase back as far as it will go. I had to hollow out the block of wood a lot to get weight out of the front of the car. We used about 2.5 ounces of tungsten in the rear, and trimmed with lead wire. Since we routed out a lot of wood in the front, there were big holes in the bottom, so we sheeted over them with 1/64th plywood. We used images of the actual Nascar from the Internet. For the body we used an orange paint, made some of our own stickers, and purchased the ‘sponsor’ stickers from a Pinecar rack at our local hobby shop. Painting involved a lot of masking. Some of the black stripes were drawn on with a sharpie after masking. Headlights were hand-painted. Once all the stickers were on, we covered with a clear coat. 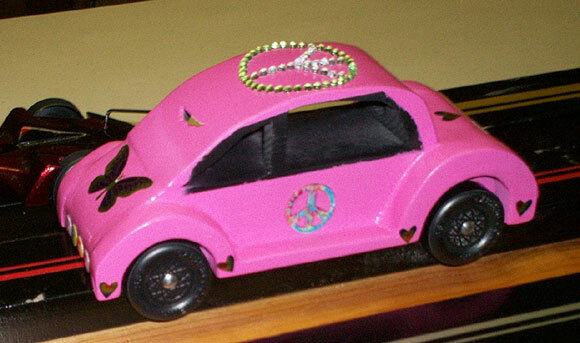 One of my scout’s sister, her father and I built this VW for the pinewood derby. It took us about three hours to cut it out. We made a few mistakes, but finally got it right. We had to cut out the windows on each side, and hollow the bottom to reduce the weight to five ounces. I noticed that the axles have ridges on them where the wheel bore would roll. Isn’t that kind of a natural friction reducer, since they will ride for at least a portion of the rotation on those ridges? If you remove the ridges are you not just increasing the surface contact area between the axle and the bore? The problem with the ridges is that they are not consistent, and they will tend to cut grooves inside the bore of the wheel. If the ridges are placed facing upwards, they will affect the wheel less, but it is still best to remove them. 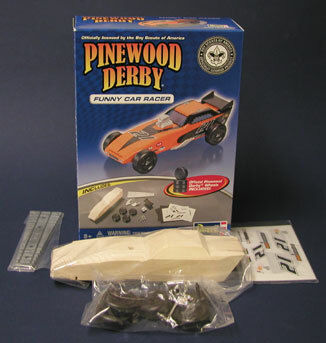 What are the fastest times for a BSA Pinewood derby. My son won the fastest car at our local event at 185 mph. Someone at the event has seen cars as fast as 200 to 220 mph. Do you have any history on this? What are realistic times to be a top competitor? Congratulations on the victory. Unfortunately, times and speeds are track dependent. So you can’t really compare to other tracks. Tracks vary in length, slope angle, and composition all of which affect speed. Even the same track will vary from year to year, due to the location and the way in which a track is set up. MPH is calculated based on distance and time. So higher speeds are calculated on shorter tracks, as the cars have less time to slow down. Conversely, very long tracks will have relatively low MPH calculations, because the cars must travel on a long flat section on which they slow down considerably before the finish line. I have searched a bit for what an Outlaw race is all about, but didn’t find much. I was just wondering if there are some starting points to follow to have a successful Outlaw race? Wheelbase and wheel mounting – subject to all dimensional requirements in the rules, wheels may be mounted anywhere on the block, and may be mounted in axle holes or slots. Weight – the weight limit may be increased. I recommend no more than 1 pound. Wheels/axles – any plastic wheels may be used, and any axles may be used. Another option is to allow safe propulsion (no rocket motors).